A new civil filing in New York alleges that the bank’s subsidiaries engaged in widespread securities fraud before the financial collapse. The Residential Mortgage-Backed Securities working group—a joint federal-state task force announced by President Obama at this year’s State of the Union address—filed its first case yesterday, targeting big-six bank JPMorgan Chase for widespread fraud leading up to the financial collapse of 2008. The civil case, filed in New York State Supreme Court by New York Attorney General Eric Schneiderman, a co-chair of the RMBS task force, targets the practices of the former Bear Stearns, which was acquired by JPMorgan Chase in 2008. Between 2005 and 2007, the suit describes how Bear Stearns was hooked up to a firehouse of mortgages that it must have known weren’t being thoroughly evaluated before being packaged them into MBS’s (mortgage-backed securities). One Bear Stearns employee cited in the filing said he evaluated 1,594 loans in a five-day period—a truly impossible task, and one that people at Bear must have known wasn’t adequate. The suit also describes how the bank had an internal quality-control unit that it knew was in “crisis,” but neglected to change any protocols. Of course, all the while Bear Stearns was telling investors that it carefully investigated all of the loans, and assured them the MBS’s were top-notch investment products. When it did send them for a (limited) review by Clayton Holdings, a third-party evaluator of mortgages, it ignored the warnings furnished by Clayton. (E-mails and other documents from Clayton Holdings to officials at Bear are included in the filing). This is a fairly amazing chain of fraud being alleged—but that’s not it. The suit also describes how Bear Stearns executives were indulged in a shameful double-dipping scheme. When loans inevitably started to go bad, some within a month, the bank was required to take them out of the securitization products and seek restitution from the mortgage originators. Bear Stearns executives would go to the originators and sell them back the bad loans for a fraction of the original cost, according to the suit, and then leave the mortgages in the MBS’s—all while pocketing the money they got from the originators. Schneiderman filed the suit in New York under the Martin Act, a unique law in that state which gives prosecutors more leeway in filing cases because they don’t have to prove an actual intent to defraud. (This can be a difficult burden to meet, as defendants can simply claim incompetence and lax oversight.) It doesn’t ask for specific damages, but notes that investors lost $22.5 billion in these deals and says that the defendants should disgorge their profits. Though this was all conduct by Bear Stearns, JPMorgan Chase became legally liable when it acquired the bank in 2008 (with $29 billion in help from federal taxpayers). And JPMorgan Chase isn’t guilt-free in an of itself—it’s been profiting off the fraud initiated by Bear Stearns, and maneuvering to keep it away of the public and legal eyes so as to avoid having to lose money. The case is significant for several reasons. When the task force was announced in January, Schneiderman said it would go after “the stuff that blew up the economy,” and going after the fraudulent bundling of MBS’s is certainly a stab at that. The suit also alleges a broad, systematic pattern of conduct—platform-wide fraud that goes beyond a specific deal. While the SEC could have filed similar charges, not only would there not be the lessened burden of intent under the Martin Act, it would relate only to specific deals—this case is attempting to charge a broader pattern of conduct. And in fact, a person briefed on the investigations told me that “we intend to follow up with similar actions against other sponsors and underwriters of RMBS.” So other big banks might soon find themselves the target of similar Martin Act cases. 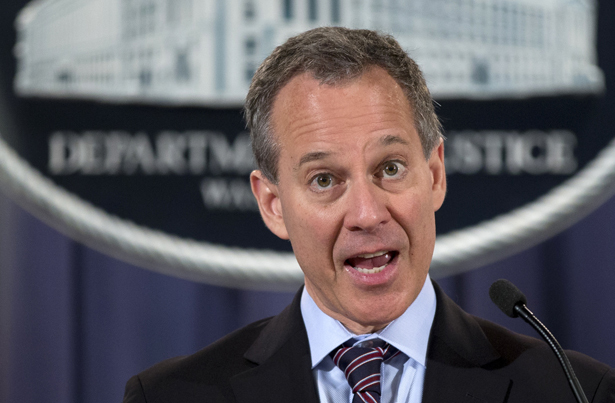 If inclined, Schneiderman could bring criminal charges under the Martin Act as well at some point down the road—while the act has a higher burden for criminal than civil charges, it’s still lower than most federal law—a fact that terrified some on Wall Street when former New York Attorney General Eliot Spitzer threatened criminal Martin Act prosecutions. But the RMBS task force is giving no indication it plans to do so. Another drawback is that homeowners can’t benefit from any settlement reached here: since investors were defrauded, any restitution would go to them. Broader action against Wall Street laying out a pattern of fraud could at some point lead to homeowner relief, but this case will not. Also, some critics have noted that there aren’t really any new legal theories or evidence in this case—private investors and banks have been suing Bear Stearns for the same essential fraud for years. That’s true, and if anyone was hoping for a brand-new avenue into prosecuting Wall Street fraud pre-crash they would be disappointed. Lawyers for those private investors, at least, told The New York Times they were pleased with the case, as they see it as a validation of their claims—which are achieving (slow) progress in the court system. Last week JPMorgan Chase lost a legal battle in trying to get similar claims by a Belgian-French bank dismissed. It’s also useful to note that the new filing broadens the case to where the investing public can be eligible for restitution, not just the individuals currently filing suit.